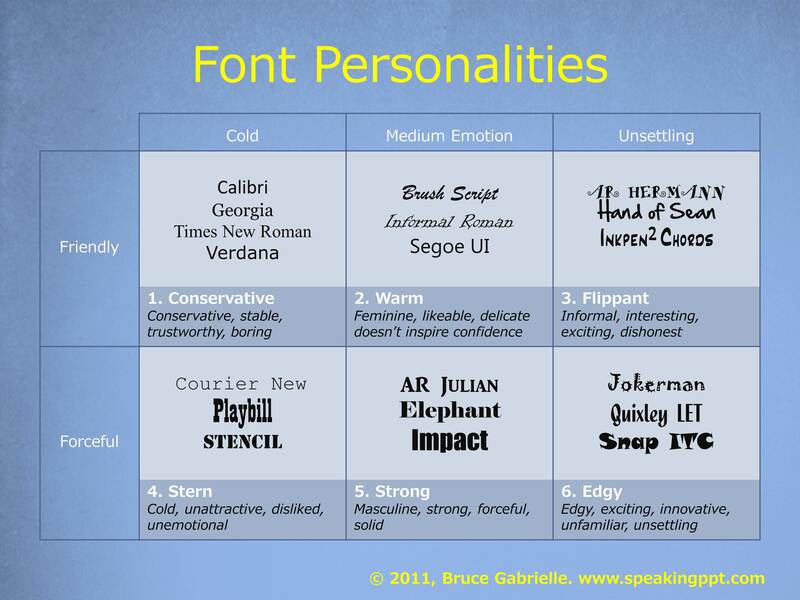 In my workshops, I’m often asked which is the best font to use on PowerPoint slides. The short answer is to choose a font the way you would a business outfit: use a font that’s readable, reflects your personality and makes you feel good. So which font should you choose? That’s like asking which outfit you should wear. If you’re having an important business meeting, wear the brown suit. If you’re speaking at the TED Conference, wear jeans and a turtleneck. Going out on a date? Wear that flirty little black dress. Your font choice should be a conscious decision based on the image you want to project. The ONE piece of advice I feel strongly about is to not use the default Calibri font. It makes your PowerPoint slide LOOK like a PowerPoint slide and everyone else’s slides. Presentation designer Jan Schultink gives this remarkable piece of advice: to ensure great design, don’t let your PowerPoint slides look like PowerPoint slides. Calibri screams PowerPoint! Take a look at these two slides, using Calibri (left) and Meiryo (right). Can you feel the difference in energy? To manage the default fonts in PPT 2010, got to Design > Fonts and select Create New Theme Fonts. Then choose new fonts for titles and body text and name your new custom font setting. Unfortunately, there’s no way to choose this as the default for all your future presentations. So, as you create presentations, you’ll first have to navigate to the Design > Fonts menu and select your new font styles from the menu. I’ll be writing more about font choice, and sharing what the research has to say, in future blog posts. Sign up to receive blog posts in your inbox. Do Your PowerPoint Slides Have A Clear Visual Path? Great post and I love your writing style too!!! Looking for more chart make over tricks in power point. Please suggest when and how frequently we should use animation. I had real trouble spotting the difference between the pair of slides above. Other than the right-hand one having slightly bigger text, the main (yet tiny) difference seems to be the middle spoke on the “3”. So the two fonts could hardly be more similar! Nancy Duarte and Garr Reynolds make quite a big deal of font choice, but they’re coming from a design perspective, and of course most audience members aren’t designers. So like you say, as long the font is readable (the main criterion) – and I’d add “goes unnoticed by most of the audience” (another big proviso) – I think the font doesn’t really matter. I suppose many people have “hang-ups” about 1 or 2 fonts. (Mine is Arial.) But I doubt many of those people are typical of a business audience. And even if they were, who’s to say the font you or I happen to choose will be more acceptable to them? It might be LESS acceptable! I agree that looking different from other people’s decks is important. (In fact I’ve developed an approach called the FiRST framework, and the S is short for “Stand out”.) I’d argue that font choice is only a small and rather risky part of how to stand out, though. Hi Craig – thanks for your thoughtful comments. Calibri is a great font and a wise choice to be the PowerPoint default. Calibri was specifically designed for on-screen reading; perfect for the business exec. Its compact size allows you to pack more words per square inch that are completely readable. It has an elegant round design that looks modern. So it’s a great font. But because it’s used by everyone, it packs no personality. Some might say this is a positive; you want your text to be “invisible” and not call attention to itself. But I disagree. I believe text with a bit of personality can enhance the overall presentation of your ideas. I was recently reviewing some PowerPoint decks created by a market research firm and was impressed with their font choice for slide titles and graphs (Segoe UI). It really made the slide pop. And despite my skeptical analytical nature, it made me like the data more. Segoe UI is not a default in PowerPoint; that was a conscious choice by the research firm – and a smart one. A business audience will be made up of a mix of people. Some, like you, could care less about the font choice. Others, like me, are sensitive to font choice. There are literally thousands of fonts available, and for a reason: good fonts add personality to your slide which can enhance your credibility. I guess the bottom line is – know your audience. I would have to say I have for years sided with Craig on this issue…but. As the stakes get higher I am looking to tap into every advantage that can make my presentations more appealing in a professional sense. I’ve also learned more about first impressions on our subconscious and how important visual influences are in our decision making psychology. So, if choosing a different font instead of Calibri might make a slight difference then it’s important for me to make that change to my templates and future presentations. Successful companies leave these choices in their advertising, name cards, websites and publicly viewed material to professionals and it is this trained group of people that do not stick with boring and over-used fonts. As a professional trainer who uses PowerPoint on a daily basis I have chosen a set of fonts that are similar to the standard fare, but add a slight more pop to my slides. By the way, while Googling this topic I found a recommendation for a Sans Serif font which is good for titles and labels: Segoe UI. Thanks for the comment John. I’m also a professional trainer and market researcher, and like to impress clients and students with distinctive slides. Font choice is one of the easiest ways to make a better impression. You inspired me to share a post this morning, demonstrating the effectiveness of using a font other than Calibri. Thanks Bruce for this simply described but enlightening post. I come from the instructor world and where we look very hard at how much a students retains during the training. Power point is typically the classroom method of instruction so it is very important that you slides allow your student to retain as much as possible. The key to any presentation is getting your message out and the student learning and retaining. Ariel is not liked by most instructor institutions as it is plain and not eye catching. You must remember that we are all visual learners and when a student first looks at the slide they are taking a mental picture about whatever you subject is. the biggest mistake I see non instructor train people do is try and put on the slide everything they want to say. if you do this you student will retain zero and this is a proven concept in the training world. Power point should be a visual reference for the student and instructor for what the topic of the slide is about. A picture speaks a thousands word and the instructors knowledge is the key.